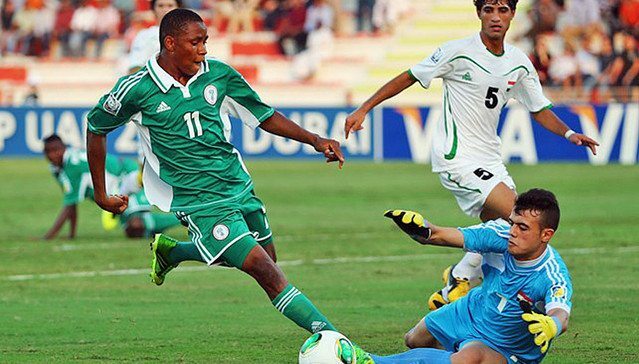 Nigeria Under-17 national striker Musa Yahaya is wanted by both Tottenham Hotspur and Manchester City according to media reports. When Nigeria won the Under-17 Fifa World Cup in November the 16-year-old was one of the star performers at the tournament. City look most likely to land the youngster as they have been strongly linked to signing his international teammates Chidiebere Nwakali and Kelechi Iheanacho even though reports have surfaced that Spurs are also chasing the players signature. The deal is thought to be in the region of £400,000. Yahaya started his career at Mutunchi Football Academy in Kaduna, he admires Real Madrid’s Brazilian and 2007 World Player of the Year, Kaka. He is nicknamed Iniesta!